Alexandra Runnion | The PHOENIX Some water in Rogers Park, like other areas in Chicago, has tested positive for lead. This has caused some students living off campus to worry about their tap water. Results from recent home water tests in Rogers Park displayed traces of lead, a deadly neurotoxin. The poisonous heavy metal has been found in the tap water of some of the older homes and duplexes which house thousands of Loyola students and Chicago residents on the North Side. A recent analysis by the Chicago Tribune revealed higher lead levels in the tap water due to pipe corrosion of nearly 70 percent of tested Chicago homes. There’s no acceptable level of lead in a person’s blood, and if the lead level in water exceeds the Environmental Protection Agency (EPA) Action Level of 15 parts per billion (ppb), people should take action to control their exposure to lead in the water, according to the Centers for Disease Control and Prevention (CDC). In Rogers Park, 53 homes were tested, and the results showed an average lead concentration below five ppb, with maximum levels reaching 17 ppb on the first draw, 13 on the second draw and 11 on the third draw. More than 4,000 miles of water mains lie underneath Chicago’s streets. Many of these water mains connect to service lines made of lead. The city’s plumbing code required homeowners to have lead service lines until the 1986 Safe Drinking Water Act was passed, and lead pipes were banned due to the dangers of lead corrosion. But people were never required to change their service lines. Lead consumption can have deadly consequences, especially in children. Lead can disrupt the childhood cognitive development causing behavioral problems, delayed growth, anemia, premature birth and auditory problems, according to the EPA. While less common, lead can also affect adults, causing cardiovascular defects, decreased kidney function and reproductive impairments. Kana Henning, associate vice president for Facilities at Loyola, said the university does five random lead tests of residence and academic halls on campus every summer — all have been negative. She said Loyola has filters on every water fountain found around campus. While Loyola might test negative for lead in the water, the Tribune analyzed results of water tests from 2,797 homes in Chicago from 2016-17. These results came from tests done by Chicago residents with testing kits offered for free by the city by calling 311. According to the article, 70 percent of homes tested had lead in the water. It also said three out of every 10 homes has lead concentrations above five ppb, which is the Food and Drug Administration’s (FDA) maximum lead concentration level for bottled water. Michael Hawthorne, one of the writers of the Tribune’s report, said the majority of Chicago homes still have lead service lines, including many of the single-family homes and duplexes in Rogers Park. The larger apartments typically have safer cast iron service lines due to the larger amount of residents they serve. “We know from the city’s own statement that roughly 80 percent of homes in Chicago have service lines made of lead,” Hawthorne said. 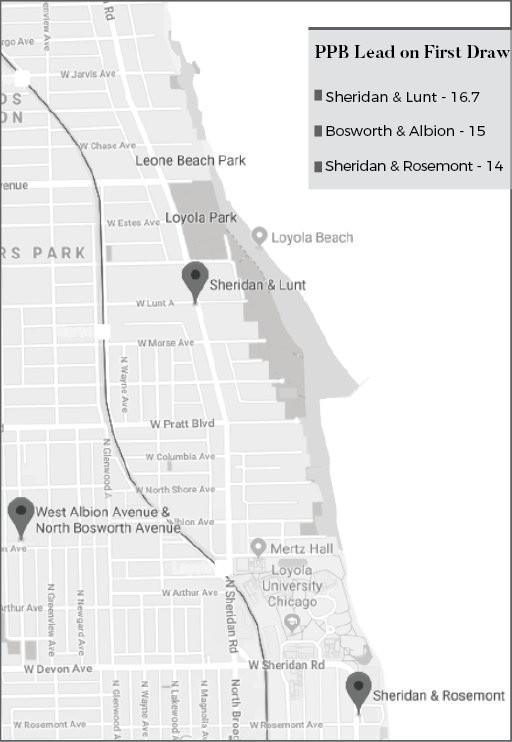 Samples from the block of Sheridan Road and Lunt Avenue, just north of campus, as well as Bosworth and Albion Avenues, both were at or above 15 ppb upon first draw, according to the analysis. Other locations, such as the block of Sheridan Road and Rosemont Avenue, displayed levels of lead above the FDA’s maximum ppb for bottled water. Hawthorne said this analysis was prompted by a study done in 2012 by the EPA which evaluated the city’s water testing methods. This study found the replacement of water mains caused further corrosion of the pipes and increased levels of lead in the water. It also found the time required to flush water that has lead in it is greater than the time recommended by the EPA. This study, as well as the 2015 water emergency in Flint, Michigan, prompted some Chicago residents to order water testing kits from the city to test their water quality. Holly Laws, a junior elementary education major at Loyola, said the most alarming thing about potential lead contamination of Chicago water is the lack of public awareness. “Probably what scares me most is how unaware people are that their tap water could have traces of lead in it,” Laws said. Laws said she doesn’t drink the tap water from her Rogers Park apartment. She uses a water filter that’s supposed to remove 99 percent of lead and other chemicals from the water. “We haven’t talked to our landlord about it, in our lease all it discloses is that there is no lead paint in the house, but [the landlord] doesn’t have to disclose whether they are aware of lead pipes,” Laws said. Federal law states property sellers and landlords are only required to disclose lead paint on sales contracts or leases. 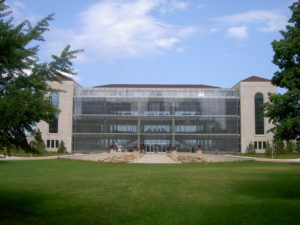 According to a letter to the Tribune from Dr. Howard Ehrman, an assistant professor in the college of medicine and school of public health at University of Illinois at Chicago, while Mayor Rahm Emanuel is currently working to replace Chicago’s water mains, the city’s plumbing code states if Chicago residents want to replace their service lines, they must pay for the full cost of the replacement. Hawthorne said federal regulations for water quality can be problematic. If 90 percent of homes tested show lead concentration below 15 ppb, the city is compliant. Chicago is only required to test 50 homes every three years, and the results show that Chicago complies with the regulations. Another report by Hawthorne in 2016 said that many of the homes tested are owned by current or former staff for the Department of Water Management and of the Northwest Side, where the risk for contaminated water is low. The EPA said in a statement to The Phoenix the city has been compliant since the 1990s, and they acknowledge that pipes made of lead may cause detectable amounts of lead in the water. The statement also said Chicago adds a chemical called orthophosphate at the treatment plant to control corrosion of plumbing materials in the network of pipes that deliver water to residents’ taps. The EPA will continue to work with Illinois EPA and Chicago’s Water Management Department on reducing lead exposure from drinking water. “The city of Chicago can say, based on their limited but legally compliant testing, ‘Hey, everything is great,’” Hawthorne said. Hawthorne said this data is an important factor in starting the conversation and making change.